This year our theme is a Cajun! Do you like gumbo, jambalaya, red beans and rice, meats, sausages,seafood, bread pudding, apple/pecan/sweet potato pies and, oh yes, BEER? Well, this is the Pacific Gravity party which will have it all, thanks to YOU, the Regiment of Loyal Graviteers. Are you willing to step up and do a bit of cooking for this event? Ian Fraser has come up with the main menu, and we need to divide some of the cooking, due to the large quantities we will be serving. Anyone willing to help should contact Ian or Michael Steinberg. Side dishes are needed to supplement the main courses. Salads, snacks, side dishes, and desserts are welcome. If they compliment the Cajun/Creole theme, that would be ideal. Prizes will be awarded for all winners. If you keg your brews, bring one. If you bottle, bring several. Meads, wines, sake, and any other homemade fermented beverages are always welcome. As if all the above were not enough, we will be having the best raffle of the year. In the past we have raffled off brewing kits, chillers, kegging equipment, bottles of expensive beer, and other valuable prizes. Tickets will be sold before the raffle at the gate for $1 each. There will be a live band playing as well as recorded music. The party will be happening on July 18, 2009 at Dean Sussman’s little grass shack in the Pacific Palisades. The address is 1310 Amalfi Drive, Pacific Palisades CA. The party starts at 2 PM and continues on until late evening. 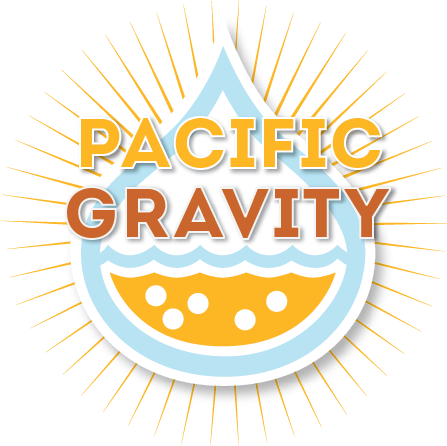 Admission is free for all Pacific Gravity members and their first guest; additional guests may attend for $15 per person. Kids are free. Dean has a swimming pool and welcomes his guests to enjoy it, as long as you bring a bathing suit, or clean underwear, and a towel. Additional underwear [of questionable origin] can be purchased from Mike Steinberg. The kids especially like this, and swimming keeps the littlest ones from drinking all the adults’ beer. As always this event is run by the volunteers, and your help is needed! Set up will be on Friday, July 17, from 6-9pm. After the party, cleanup will be on Sunday the 19th at about 10am. The volunteer crew has always had a lot of fun while working, gets to checkout some of the brew before the party, and take home leftovers on Sunday. If you have any questions about food, feel free to contact Ian or Mike. If you have questions concerning other volunteer opportunities contact Craig Corley. For more info see this month’s Gazette. http://pacificgravity.com/wp-content/uploads/2015/01/pg_logo.png 0 0 Brian Holter http://pacificgravity.com/wp-content/uploads/2015/01/pg_logo.png Brian Holter2009-07-06 23:57:022009-07-06 23:57:02Summer Party July 18th! Pacific Gravity’s Summer ‘Party Gras’: Who Needs a Bayou When You Got Beer?